New digital technologies are finally starting to shape the supermarkets of the future, as innovations like personalized loyalty programs, mobile payments and interactive digital signage, to name just a few, are markedly enhancing the overall shopping experience. As more brands begin to implement these technologies, where does the industry stand as a whole? Here is a rundown of how supermarkets are embracing digital transformation compared to other retail segments, along with steps they can take to improve their standing by embracing application-aware, software-defined wide-area network (WAN) solutions. Supermarkets overall have certainly realized the need to communicate with customers across physical and digital channels, and have taken great strides to do so. Along with enhancing their store’s web presence to provide richer product information, for instance, supermarkets are also leveraging social media to deliver notices of upcoming sales and advertise the availability of special items. The most successful digital marketing campaigns are ones that are focused on frequency and quality of outreach. When shoppers hear from brands, they expect the communication to be relevant to them at a personal level. For example, if a supermarket has a promotion on gluten-free items, then they should be targeting customers with a history of buying gluten-free, not every shopper in their database. This relevant targeting leads to trust, which brings customers back to brands time and time again. While the majority of supermarkets offer loyalty programs, there are numerous ways brands can better use them to drive higher sales. Recent studies show that a majority of supermarkets (53%) only manage a low double-digit percentage of their customers to join their loyalty programs. As a result, shoppers who take part only tend to represent a small fraction of total sales (6%-10%). Fortunately for supermarkets, this is an issue for most retail sectors, not just grocery. Supermarkets have the opportunity to better engage with these VIP shoppers by utilizing customer data to better know their most loyal shoppers. This includes taking a more careful look at their transaction histories to determine not just product preferences, but also where and how the customer is completing a purchase. This will help grocers create better targeted rewards that only loyalty-program members can enjoy, ranging from limited-time product offers to streamlined payment options. 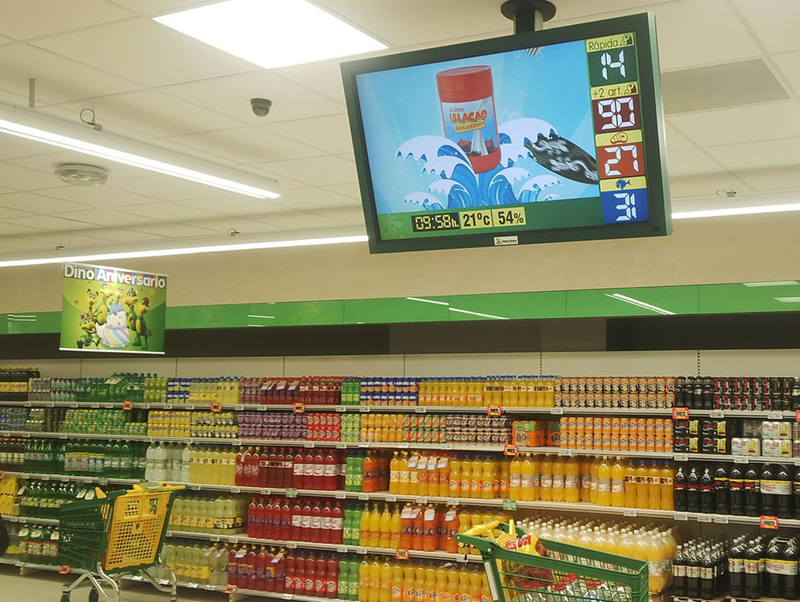 While some brands use digital screens to advertise promotions or digital deli menus, there’s a lot of potential for supermarkets to take digital signage a step further. Perhaps the best forward-looking use case is Microsoft’s “Supermarket of the Future” concept. In this scenario, motion sensors detect when shoppers have stopped to engage with a product, prompting product information to appear on a screen at the shopper’s eye level. While systems like this require a consortium of technologies to implement, including RFID, Wi-Fi and upgraded store networks to handle the increased data load, these investments have the potential to pay off in spades. Mobile perhaps holds the most promise for supermarkets, and many grocers have deployed valuable mobile applications to improve the buying process for customers. Still, many supermarkets continue to see low app adoption rates as do many other retail sectors. One reason for this is sub-par in-store Wi-Fi. Many grocers have had Wi-Fi in their stores for some time, but these networks were likely deployed for inventory management purposes, not for customers. For most shoppers, 4G signals simply don’t penetrate deep enough into the supermarket for mobile apps to work. Supermarkets should therefore focus their attention on the quality of the Wi-Fi signal they make available to shoppers, ensuring one bad experience with an app doesn’t turn customers off forever. In many ways, supermarkets are actually beating other retailers when it comes to online shopping. Grocers that offer online purchase with in-store pickup options, for example, are excelling at developing better customer relationships with longer retention. Future advancements here could lead to predictive capabilities through recommendation engines not unlike the tools Amazon uses to make customer suggestions. This could ultimately lead to higher basket values as a result of strong customer engagement. Overall, supermarkets are on a fast pace for digital transformation. Still, as with any fast-paced deployment path, there are always risks and room for improvement. Supermarkets have an excellent opportunity to leverage shopper analytics to enhance their engagement with customers both online and in-store Also, with new payment technologies appearing almost every day the opportunity to delight customers at checkout, often the largest source of friction in the shopping experience, becomes more and more possible. Most often, retailers find that their store network was not designed to carry the load many of these new technologies generate. Adding more network capacity doesn’t always solve the problem either, as many applications simply grow to fill the new capacity if left uncontrolled. Leading retailers will need to deploy application-aware SD-WAN systems that help manage the overall application performance so that apps that are critical to the customer experience get priority access to network capacity. These systems will use advanced traffic shaping and other quality-of-service techniques to ensure each session of every application gets the performance level the brand intended. These “hidden” systems will be the heroes of the infrastructure technology that enable the best digital in-store experience for customers.